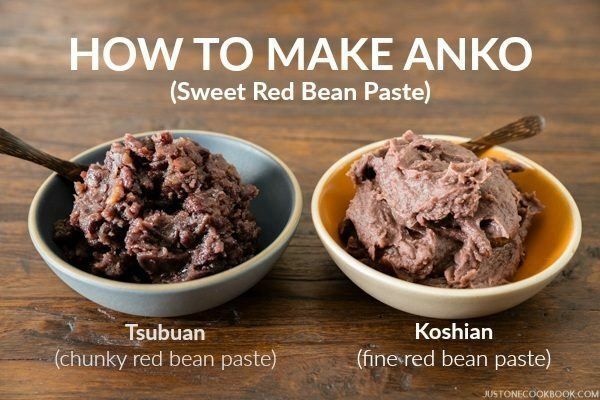 Learn how to make anko sweet red bean paste from scatch. Step-by-step pictures included. 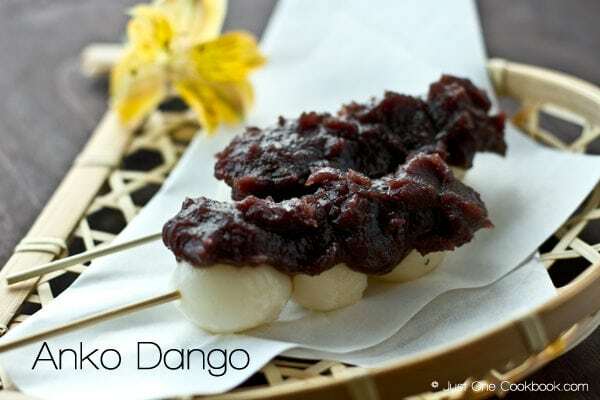 Anko (あんこ, 餡), or sweet red bean paste, is used in many confectioneries in Japan. It is usually prepared by boiling azuki beans, sometimes mashing them, and then sweetening the paste with sugar. 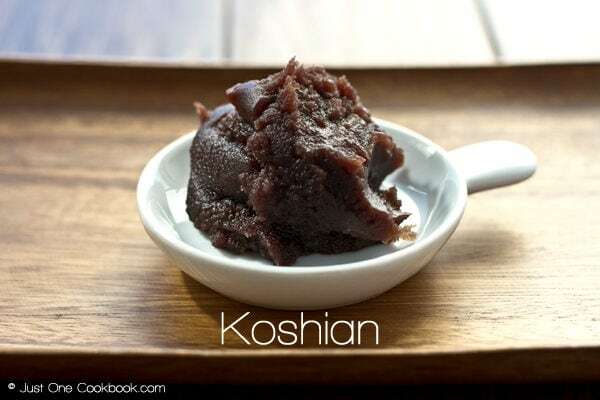 The most common types of read bean paste include Tsubuan and Koshian. Other varieties of red bean paste includes Shiroan (白あん), made from Japanese white beans, and Kurian (栗あん) made from chestnuts. All types of red bean pastes are used in many delicious Japanese sweets such as Anmitsu, Daifuku, Dango, Dorayaki, Oshiruko / Zenzai, Taiyaki, Manju, and Yokan. Tsubuan (粒あん) is prepared by boiling and sweetening with sugar, but otherwise untreated. Hence the texture is chunky. My recipe below shows you how to make chunky read bean paste from scratch. Koshian (こしあん) is prepared by passing through a sieve to remove bean skins. 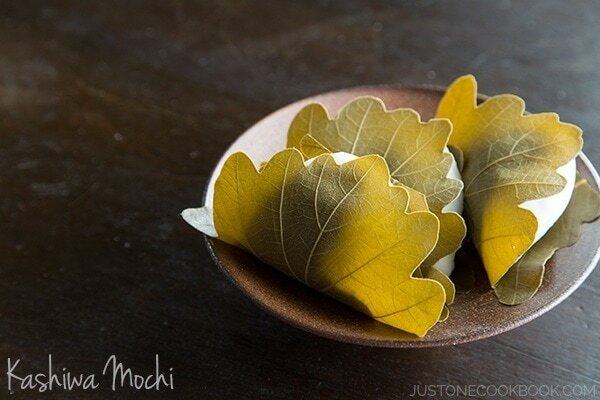 The texture is smoother and is most commonly used for wagashi (traditional Japanese confectionery). I make koshian with a pressure cooker. Check out my Pressure Cooker Anko recipe for detailed instructions. You can also purchase a packaged koshian. If you want to use a pressure cooker, check out my Pressure Cooker Anko recipe. Soak the azuki beans overnight (8-12 hours). Use a big saucepan/pot because the amount of azuki beans will double after cooking. 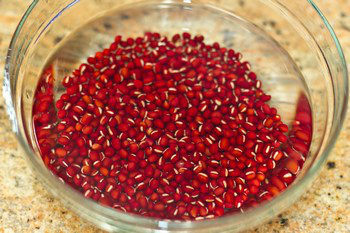 Put washed azuki beans in the pot and pour water till 1-2 inch above azuki beans. Turn the heat on high. When boiling, turn off the heat and cover with lid. Let it stand for 5 minutes. Throw away water and put the azuki beans into a sieve. Put the azuki beans back in the pot. Add enough water just to cover the beans and turn the heat on high. Once boiling, turn down the heat to medium low and keep it simmering. Once in a while push the azuki beans under the water with slotted spoon. Water will evaporate so you need to keep adding water to cover just above the beans. If you put too much water, the beans will move and break. If you need to leave the kitchen, make sure to turn off the heat. You will be cooking for 1+ hour. Pick one azuki bean and squeeze it with your fingers. If it is smushed easily, it’s done. Turn up the heat to high and add sugar in 3 separate times. Stir constantly. When you draw a line on the bottom of the saucepan and see the surface for more than 2 seconds, add salt and turn off heat. Anko will thicken more when it cools. Pour into a container to cool down. Do not leave it in the pot. Cover with plastic wrap and keep in the fridge to store after cool down. If you aren't planning to use it all at once, you can divide it into 100g packages. Wrap in plastic bag and store in Ziploc Freezer bags and can store in fridge for a week and freezer up to a month. 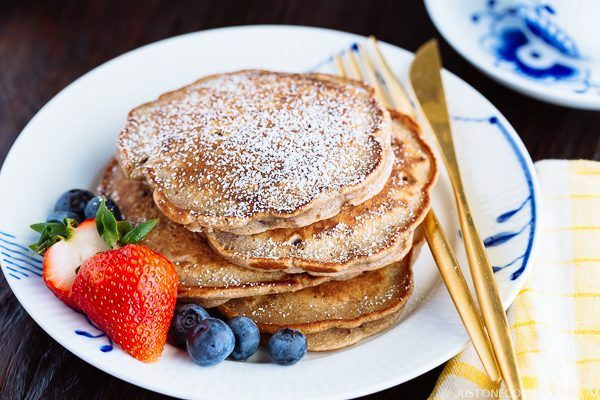 Do you recommend using brown cane sugar, regular white granulated sugar or normal brown sugar? Re: sugar substitutions: if I might add something, please? As long as the sugar in a recipe is being measured by weight, you should be fine substituting one form of cane sugar for another — *except* for icing/confectioner’s sugar (it contains corn starch which could affect the consistency). Sugar substitutes measured by volume could, however, affect the final level of sweetness. With sugars of the same granule size as refined white sugar, there would be little difference between volume measures, but brown sugar (white sugar with some molasses added) can be packed loosely or tightly into a cup (recipes including brown sugar usually specify which) so the weight of a cup of brown sugar can actually vary between recipes. My two cents’ worth. Best wishes. Hi Elizabeth! This is WONDERFUL! Thank you so much for sharing your knowledge! It’s very true about the difference made by the volume, which is why I started to use the weight for baking just to get more precise result. 🙂 Thank you once again for your kind feedback! Thank you so much for the recipe! I have tried to do this before but sadly missed the mark. Your recipe was easy and really tasty. I have two questions, how much salt should be used? And when I cooked it, the beans lost their red colour, but it became perhaps a bit purple, with white inside. Is that okay? 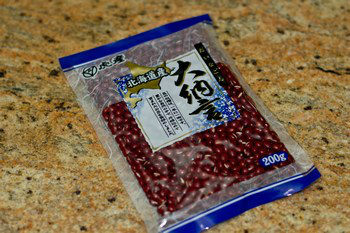 I bought a Shirakiku brand Azuki bean – I don’t know of that’s good or not? Either way, a lot of red did disappear over all, but the end result was a bit purplish-maroon. It tastes great, despite the fact that I should have cooked it a bit longer to reduce the full beans in the paste. Hi SLD! 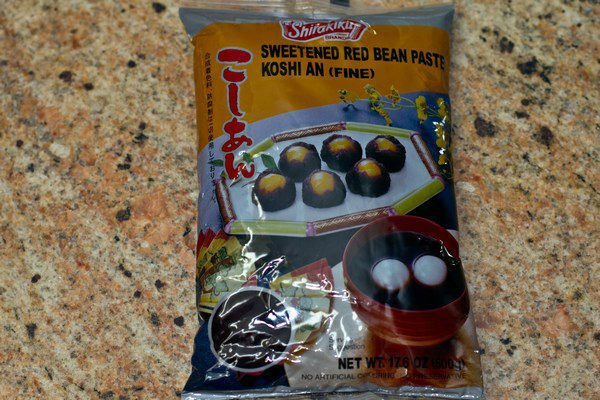 Shirakiku brand is okay – not the top quality azuki beans but I sometimes use that brand products too. 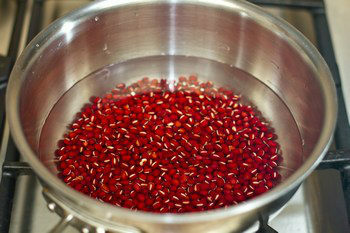 And it does disappear some red color as you cook. My red bean color is just like how you see in my pictures. It’s hard to call this “red” though so we may have the same color. Was yours different color? At step #8, the bean is smushed very easily, almost without any strength. That’s the key for hardness. Thank you so much for your feedback again! How many cups is 7oz of beans and 7 oz sugar? I have standard U.S. measuring cups but no scale. I just checked this and 7 oz of beans, is just under 1 US cup for the brand of red bean I have. The sugar (I have Rogers fine granulated) worked out to ~85/100 cup. That should be about approximately 3/4 cup + 2 tbsp. By the way, love the recipe! My friends from Japan thought the diafuku I made with this anko were wonderful. I’m so happy to hear you liked the recipe. It’s nice to make homemade anko because we can control the amount of sugar we put in, while premade anko is convenient but often it’s too sweet. Thank you very much for your feedback on this recipe. I’m very glad your friends from Japan enjoyed your daifuku! YUM! This recipe was a complete success! I think I cooked it slightly too long and added too much extra suger, but it’s going to be perfect next time. Thanks so much! 🙂 I’ll be making it for dorayaki soon. Question: What do I do if I want to make Koshian style instead? Hi Tina! Thank you for your kind words. Koshian requires more extra steps so I haven’t actually had time to photo shoot and prepared it for the blog. After step 8, you can either use food processor (short cut) to make a paste, or use fine sieve to strain using rubber spatula. After that you put the mashed beans in cloth and squeeze the liquid out. Then add the mashed beans and sugar in a pot and mix until sugar melts completely. Add the salt at the end. Thank you so much!! Can’t wait to try it. At step 9, we check for the consistency and then turn off the heat. After turning off the heat, do we drain off the water and mash the red beans? I don’t see this step. 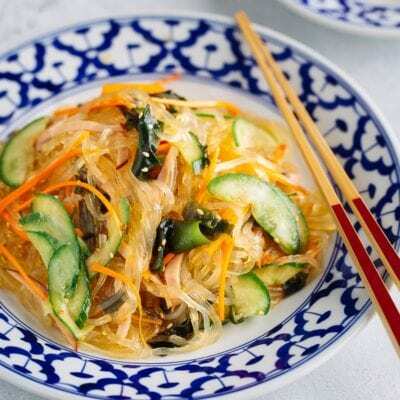 Can i use normal red bean to make this? Thanks Nami, loved the detailed instructions and pictures. I’d always wanted to make this. I used the same technique. With 200g of sugar (I used raw sugar), it’s still on the sweeter side. What is the smallest amount of sugar you’ve tried using to get the same texture? Hi, With the uncertainty of Japanese products possibly being contaminated from the nuclear fallout after the tsunami and the knowledge that millions of pounds of tainted products were shipped to be sold abroad do you know a domestic source of those beans? I mean, if they grow in japan, they will possibly grow in a large part of the rest of the world in similar climates. Any idea where to get some that are not from Japan? I have found them on Amazon, although your local health food or grocery store may carry this brand, which also markets Buckwheat Flour and other grains. Bob’s Red Mill – Premium Quality Adzuki Beans, package is marked Product of the USA. PLEASE PLEASE PLEASE! Measurements in cups! Hi Rebecca! It’s hard to be precise with cup, but the recipe is now updated. Hope you enjoy! Hi, how long will the paste be good for if kept in freezer? Thanks. Hi Vanessa! It’s usually recommended to use within 1 month, but 3 months is okay but remember the quality level is not the same as within 1 month period. 🙂 I’ll update the info in my recipe. Thanks for asking! 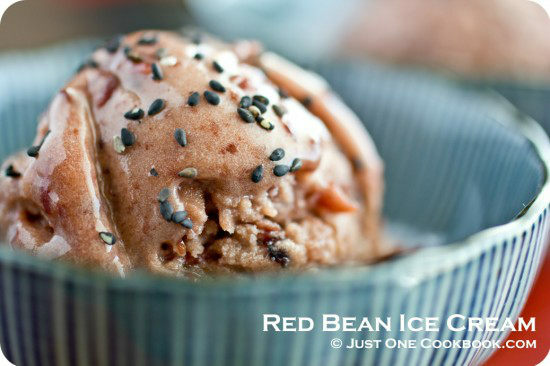 I’ve had red bean ice cream & bean rolls (i believe) & they were absolutely wonderful; what other sweet red bean snacks can you recomend? No, I’ve never tried with artificial sweetener before. http://www.recipesource.com/misc/hints/diabetic/sugar-subs1.html gives the conversion between sweetener and sugar. Might be useful if considering a conversion/ substitute. crepe (which I had never heard of either) and it says it uses anko custard and cream.. If so, do you have a recipe?? I really liked this recipe. It has easy instructions and the photos are really useful! I followed it to make my own red bean paste. I decided that the store bought paste with corn syrup could be improved upon! Instead of white sugar, I used organic coconut sugar by Madhava (Costco) and the taste is delicious. One thing though. I will cook it far beyond the beans being “easy to squish” next time because when I did that the end product wasn’t a paste; instead it was semi firm whole beans after it became more solid during the cooling (still yummy). Next time I’m going to boil it beyond that by double the time I think. I am very excited to try this recipe. I want to make taiyaki and my pan has just arrived. 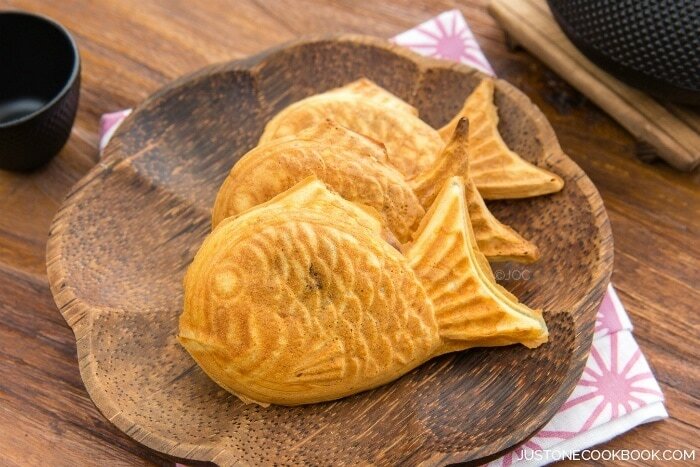 Do you have a taiyaki recipe? Hi Donna! I’m so jealous you got Taiyaki Pan! I’ve been thinking about purchasing it for years, and every time I go back to Japan I think about it, then my luggage is too big that I give up. 😀 Maybe one day! Hope you enjoy homemade Taiyaki! Do you know how long it last in the fridge? I made this and used your Dorayaki recipe with it. Everyone but my mom loved it. She ended up just eating the dorayaki pancakes. Thank you for posting this! Hi! There is no accessible Japanese store in my area, so looking for the word Azuki is hard 🙁 Are azuki beans the same as red mung beans? Thank you! And great photos! I absolutely love your attention to details! Those little slippers are so cute! I think you can get azuki beans on amazon. Thank you for the prompt response! Your final product looked perfectly fine and smooth in the picture. I was guessing skins were removed since they tend to leave bits & pieces. I’m wondering which step(s) were primarily responsible for making that nice texture? My apologies…Just looked at the pictures again and realized the smooth one I focused on was Koshian but recipe is for Tsubuan, which has skin in it, but still looked very rich. Nice! Thanks again! Thank you!! My nieces have just tried red bean for the first time, and have fallen in love. Unfortunately, where we live there are few places to buy red beans sweets. Now I can make some for them. AMAZING! Turned out perfectly! Thank you! Hey Nami, do you know why the boiling water is emptied and then refilled? Cooking With Dog uses the same method and I don’t know the reason. Nami you are my hero! Hi Yunari! Aww thank you for your sweet words! 😀 I’m so glad to hear you like the recipes! And your daughter is just like mine, loving dorayaki… except that I don’t make a cute HK pancake shape. Haha 🙂 Thank you so much for your kind feedback! Hey there! First off just like to say this looks soooooo good! Been taking a look at your recipes for two days and they all look amazing! Just screaming to be made! Hi Fahad! Thank you so much for your kind words. There are many substitute information when you look for azuki beans’s substitute. Some says kidney beans are ok, some said not good. As I haven’t tried it myself, it’s very hard for me to make a suggestion (especially taste and texture are important). Azuki beans can be found in health food store , and maybe you can check there instead of regular supermarket. Hope this helps. Overnight usually means 8-12 hours. I updated my recipe with the info. Thank you! When I tried to make koshian before, I stored it in a glass jar (unsealed) in the refrigerator. Sugar crystals formed in the koshian afterwards. How do I prevent that? Did I do something wrong in the recipe? I may have used more sugar than suggested. Thank you for posting this! 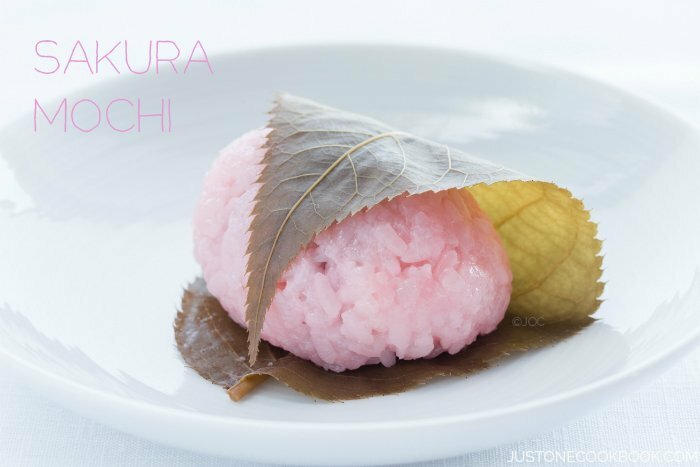 I’m interested in making mochi and this recipe will help me know how to cook the beans just right! Can you direct me to a good mochi recipe? I also have discovered a red bean boba shake and I would like to try making it myself as I think it would be tasty even without boba added. Hi Elizabeth! 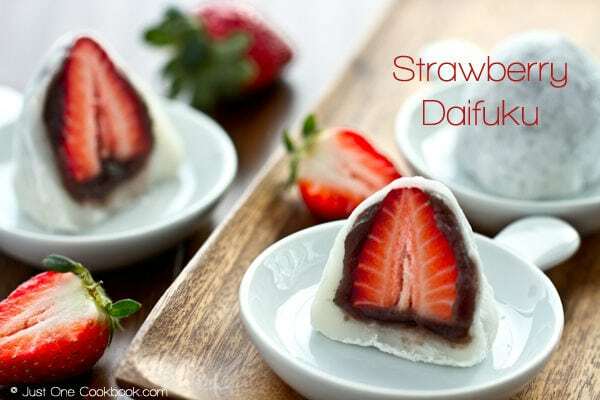 I’m going to do the mochi tutorial one day with video, but meanwhile, you can check out this Strawberry Daifuku as a basic recipe. Hi Nami: Success! We now have red bean paste cooling in the fridge. I loved that you explained “how” and more appreciated the “why” so I had no surprises and was assured success. I was introduced to red bean paste in Korea and enjoy it very much as a substitute for chocolate…..but really there is no substitute for chocolate. I have read the comments to this recipe and I don’t think you would ever be able to substitute the sugar for a low/no calorie option as a sugar is needed to caramelize the beans. Thank you…this is a “keeper” recipe for me and I will be creating a cheesecake w the paste I made today. 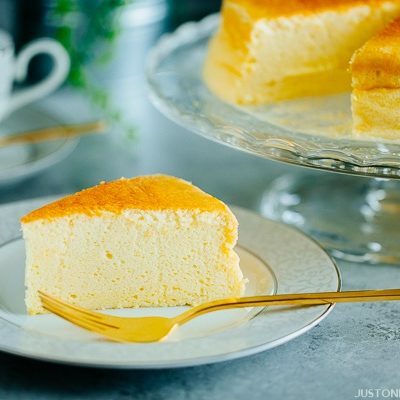 You’ll make cheesecake with red bean paste! Wow I’ve never tried that before and I’m jealous you get to eat it. 🙂 Hope you enjoy anko! Have you ever done this in bulk, say 20 bags of beans at once? To elaborate, I have tried your recipe and it came out really well; I used it for taiyaki. Yay. 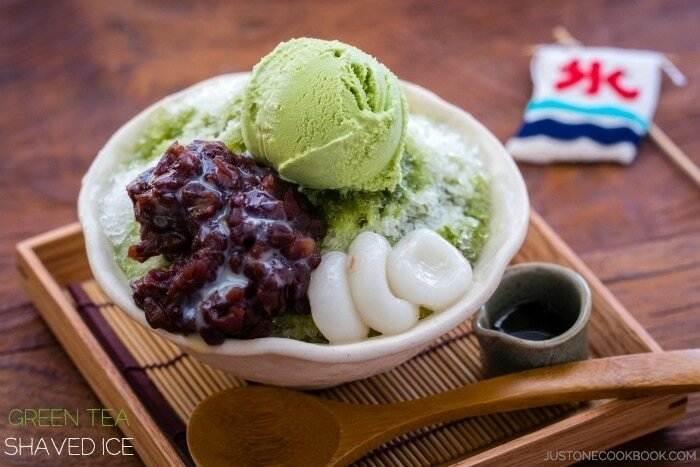 Now I have an ambition to serve the azuki with shave ice here in Hawaii for a fundraiser and will need a lot of azuki. I am planning on making 20 bags worth in one big pot and was wondering if you ever made this recipe in bulk, and if you had or know of any issues with cooking this much at once. Hi Deron! Thank you for the update! Awesome news! 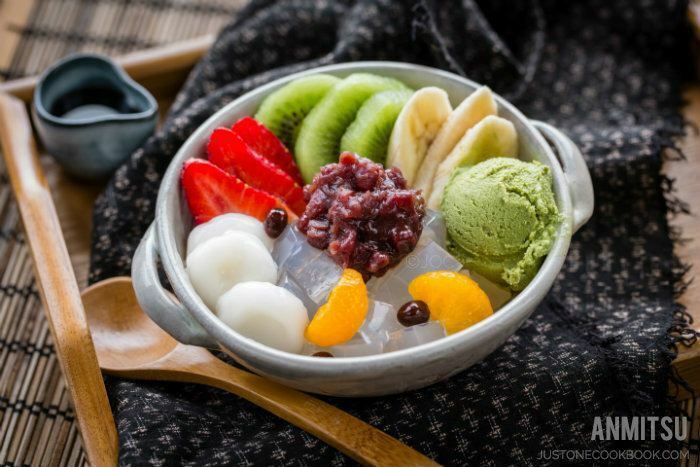 So glad to hear the azuki with shaved ice was a hit! I need to buy a shaved ice machine this year… 🙂 I wish I live nearby so I could have leftover anko! Thanks again! How long can you keep Anko? I’m not quite sure if I’m going to use it up in one time. It is my first time attempting anko. strange after soaking for only 1 hr. Also, do we top up with tap water or hot water when the water evaporates? Thanks! Hi Christine! I did some research on the wrinkles after soaking, but couldn’t find the same case. However I read the same thing happened to soybean (daizu) and the reason was that the skin is soft and got expanded first by hydrating. But the wrinkles disappear when the soybean (inside) start to expand after hydrating. That kind of makes sense and I wonder if your wrinkles also disappeared after soaking for more hours. The wrinkles for azuki usually happen after cooking and cooling, but it was my first time hearing about wrinkles before cooking. Hope the result was okay. We use water (I use filtered water) instead of hot water. Hope this helps! I will try again with another pack of beans. Can i use regular red beans? I managed to get another packet of adzuki beans from my local Isetan. It says King Dainagon Azuki so hopefully it will work this time! 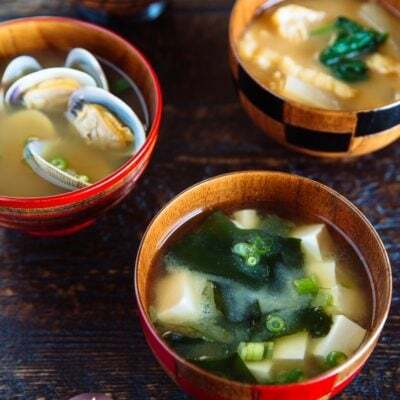 yaki udon, miso soup, nikujaga and okonomiyaki recipes so far. They all work great! Except for my okonomiyaki which I added too much cabbage. The whole mixture didn’t really hold well together. Hi Crhsitine! Those azuki beans are from Hokkaido and they are a bit bigger and more expensive (I used dainagon too). Hope anko will come out well. The tsubuan turned out well this time. I am thinking I must have used the wrong beans previously. I saw them labelled as kintoki beans in Isetan. 🙁 Which is really strange as my tour guide told me they were azuki beans when I bought them in Japan. I see. Anyway I made dorayaki with the tsubuan. Hehe. Really enjoy trying out the recipes. I hope one day you will publish a hard copy cookbook! Hi Christine! So sorry for my late response. I’m so happy to hear you enjoy my blog! Thank you for following! 🙂 Awww thank you so much for your interest in a hard copy cookbook. Well, I barely have time to keep up with my blog right now with 2 posts per week, and I’m responding to readers so slow… =P Maybe one day, when kids are much older. Thank you Christine! I love your recipes, I was wondering if you had the calorie per serving breakdown for the green tea ice cream and the red bean ice cream. Also, perhaps I missed it on the website, if so please direct me to the calorie break down for recipes. Question, will the recipe still work well if you keep a lid on the pot while it simmers for the 1+ hours? Wouldn’t it save having to add additional water throughout? Hi Olivia! I hope your anko turned out well! You have a very good question. I cook with no lid without thinking (from my memory of my mom and grandma cooking) but your question made me curious, so I checked other recipes online (mostly videos). Most people cook without lid, and some mention that you need to make sure the water amount. 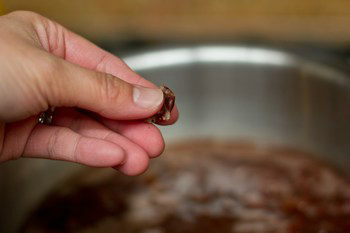 In order to keep the beans in good shape (and texture), we cook the beans under the water just above the beans. If you put too much water, beans will dance around in the water and it will easily break (according to the theory). When you close with the lid, you can’t see how the beans are doing (moving too much or covered by enough water), so most people leave the lid open to keep checking. Some people use Otoshibuta (drop lid) instead of regular lid so that beans won’t be moving too much. Hope this helps! Thank you for posting this! Your directions are very clear. I made the anko today — it had a pretty good flavour for beans from the local Bulk Barn (my only source for the dried beans — Heaven knows which brand they are). And, the mouli worked! I now have a batch of koshian. If anyone else reading this is confused about just what a mouli is, I should add that American suppliers tend to call them hand-cranked, or manual, food mills. The name mouli is used more in the UK; I’ve heard both terms used here in Canada. They are the niftiest gadgets for making soups and preserves and now I know that they can also make koshian. 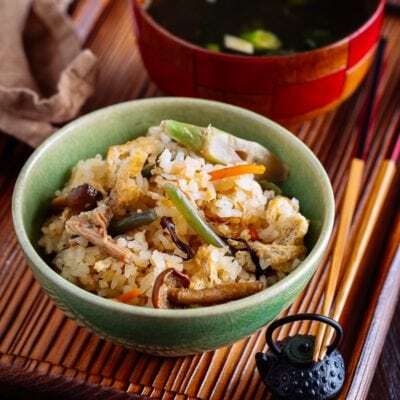 😉 My mouli, bought at our local Home Hardware, came with three grating discs — I used the finest gauge to sieve the anko. p.s. Maybe for proper koshian, there should have been less of the skins in the final product, Nami? Or, do you also force the skins through the sieve when you make koshian? What do you think? can I stir beans during second boiling time? Or wait until they’re fully cooked? I made this yesterday and it turned out wonderful! Thank you for sharing this. but If I didn’t found azuki beans can I use Kidney bean ( Phaseolus) instead ?? Are they same taste ? Hi Aya! I believe it’s not the same but some readers tried other kinds and said it worked. I just never tried to make anko rather than azuki, so it’s hard for me to answer. Would you recommend that we purée the cooked red beans before we pack it in individual portion? I made this today having trouble finding the packaged paste. I amazed myself that I had the patience to make this as it took more than an hour to get the beans soft. I love how the instructions are detailed and photographed. Thanks for the recipe! Hi Alex! I’m so glad to hear you tried making homemade anko! I hope you enjoy making sweets with anko now. 🙂 Thank you so much for the kind feedback! I thought I remembered that you have a recipe for nikuman on your site but today I cannot find anything but this anko filling, and no manju at all. Is there any chance you would want to write one? 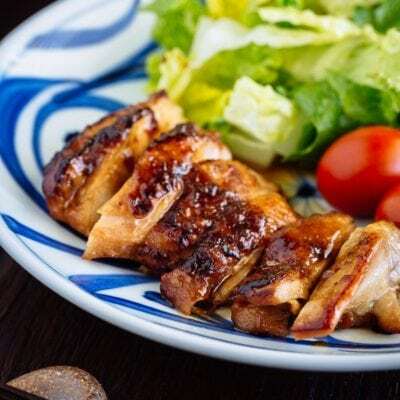 I’ve watched some YouTube videos on how to make the buns but would love to have a Japanese version of the meat filling. I think the anko above would work well for sweet. Don’t know if there are other fillings or not–so I hope you would want to present them if there are. Thanks. Hi Ruth! No, I don’t have recipe for Nikuman or Anman yet… something to consider in the future. Thank you for your suggestion! There are Curryman too. 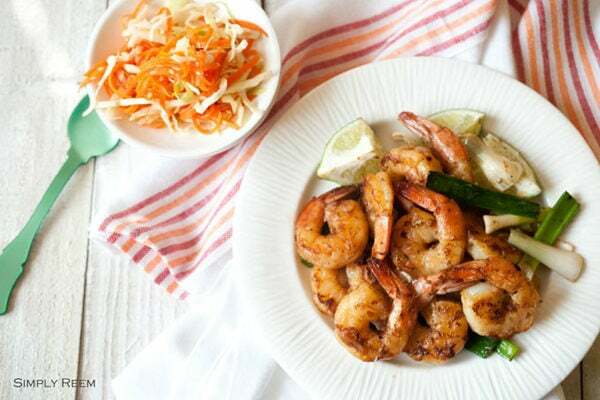 For homemade, you can stuff in fillings that we don’t normally have in Japan. I’d love to make homemade version. I’ll need to test the recipe. Thank you again! I wanted to write to you to thank you for such a well written recipe. You pointed out little things to watch out for that made it easy completely understandable. I had some azuki beans laying around so thought making mochi balls would be the perfect thing to do with them. Anyway, I ended up putting 1/2 cup honey in place of the sugar. I’m not sure how much that weighs, but I think it might be a good amount. It’s just cooling right now, but I tasted it and it seems to be the right sweetness. Hi Rhonda! Thank you so much for your kind feedback! I’m happy to hear my recipe was helpful. Glad honey worked and thank you for sharing the amount for honey with us! Hihi can I use small red beans as a substitute for azuki beans? ii just wantes to ask that i am from india and inwest so that i could not find the adzuki beans. is there any other kind i can use? thank you. Thank you so much. 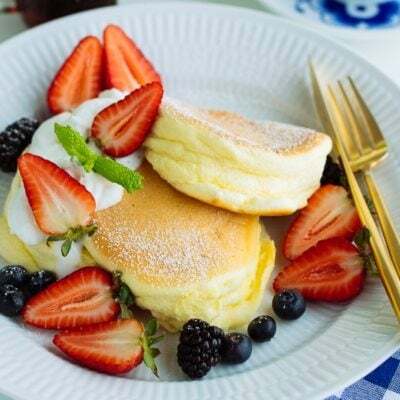 i wanted to prepare dorayaki for my husband and also because i am a great fan of japanese sweets. but i would really want to appreciate the effort you made for me. you seem to be sweet personality and again I AM A SWEET FAN! I wish you all the best. i will visit your website as often as i can and try them out. thank you!! Hi Karishma! Thank you very much for your kind words! Hope you find azuki beans one day. Or you could try out with different beans meanwhile. 🙂 Happy Holidays to you and your family! 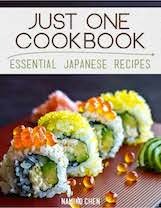 Thank for your recipes, i’ll try some when i’ll have time to cook, really enjoying reading it. Nice finishing product picture ! it’s really making me want to cook some ! wouldnt it be easier to just preasure cook the beans? Ever since I’ve been to Japan and tried Taiyaki there I’ve been wishing to make it at home again, because it was so delicious. 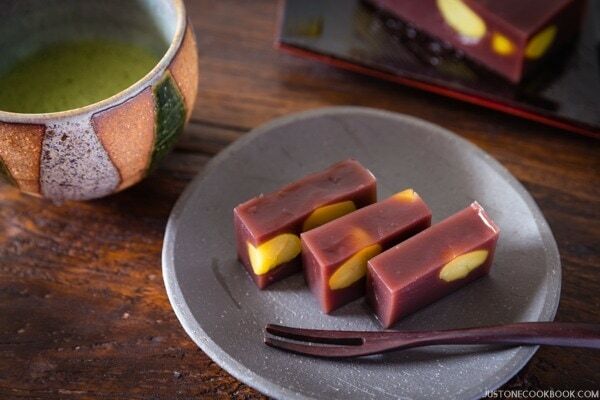 However since this year I can’t eat any sugar anymore, so I was wondering if you could tell me if it’s possible to make anko with Stevia instead of sugar, or is it really necessary to use some kind of actual sugar for the stickiness or some other property of sugar? Hello, Nami, and all of her readers. I saw that a lot of people in the US were having problems finding the adzuki beans. I just wanted to share that the store Whole Foods now sells them in their bulk section. I had to drive about and hour to my nearest Whole Foods, but I believe that it was well worth it. I bought about 5lbs so I could make lots of anko to make the daifuku for a friend of mine’s birthday. I hope that this is helpful to anyone having problems finding the adzuki beans. I am also planning on trying to make them with kidney beans to find out how they compare. I will report back soon! Hi Jamie! Thank you so much for sharing helpful information! A lot of healthy stores carry Azuki beans too. And please let us know about the comparison with kidney beans! Azuki has certain texture (kind of hard shell) and flavor that kidney beans don’t have. So I’m afraid anko is missing the taste and the right texture when it’s cooked. Looking forward to it! I quite literally just made an extra large batch of anko using your recipe, and it is truly the most delicious anko I have ever tasted outside of Japan. 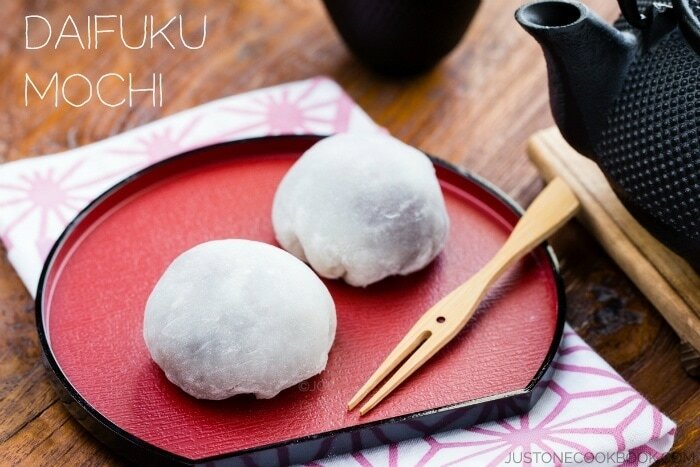 I love Japanese sweets, and Anko filled daifuku is most definitely my favourite..I live in South Africa where finding ingredients for use Japanese recipes is very difficult. 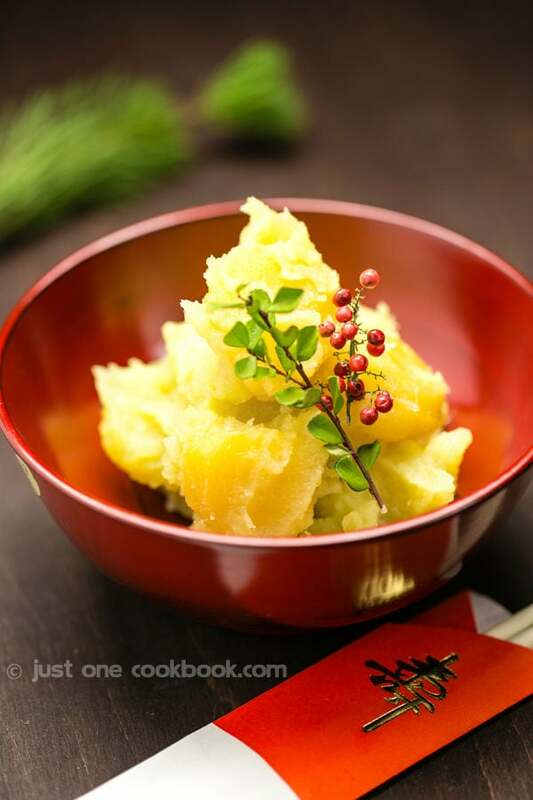 Although I have managed to get my hands on some pre-made anko, this recipe trumps it by far. PS. I used brown sugar for this recipe with a 1:1 ratio of sugar to adzuki beans, and it came out perfectly! I’ve tried to follow this recipe a couple of times now, and of the two, the first was the most successful. I seem to be having difficulty with the 7th/8th steps; beyond a certain point the beans do not get significantly softer during the simmering, and in the finished paste (I got bored around 1hr30) I found there were still some rather hard beans which were unpleasant to eat. Other than that, the flavour and smell was good. I ended up mashing it with a paste for my purposes, and removing any hard beans I found. Perhaps you have some idea what my problem is? Hi Lark! Azuki beans are famous for hard outer skin. The new beans are softer, but the old beans are very hard which will take a longer time to cook. When the beans are boiled in a short period of time over high heat, the beans gets softer outside and inside remains hard. It’s recommended to add cold water several times while boiling so that we can reduce the temperature difference between outer and inner red beans. Your beans might be older beans, so make sure to soak in water for a bit longer time. Make sure to cook on low heat as well. 🙂 Good luck! I tried again, and did some further research and experimentation. Supposedly adding the sugar gradually helps to prevent the beans from becoming hard during the later stages, as it draws moisture out of them. I can’t confirm this, but that seems to be the point at which my beans became most hard. I have also acquired some fresher beans which may perform better next time I try. I tried a bunch of things with this batch – I tried blending them, but my blender isn’t very good. I also mashed them with a fork, which was successful with my first batch, but these were even harder. In the end I just forced them through a strainer – koshian style, but with the sugar already added – producing a very small quantity of smooth paste. I don’t recommend doing it this way around, as it’s probably easier before the sugar is added, when the beans are softer. Hi Lark! Wow you are amazing! 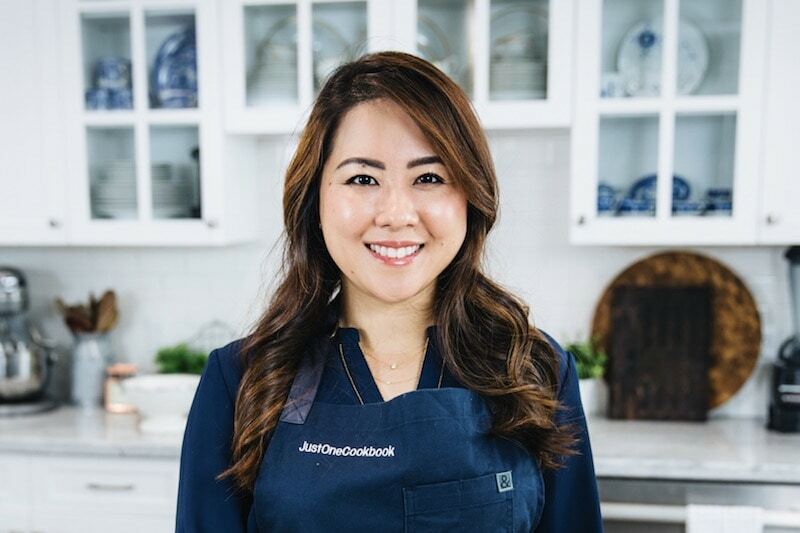 Thanks so much for sharing your cooking experience with us! I haven’t made koshian myself as it requires more steps… Your feedback will be very useful when I try! Thank you!! Hello ???? A similar thing happened to me recently. I used old beans and didn’t cook them for long enough. However, I found that if you if you steam the anko in small portions it cooks the beans which are still tough without drying out the mixture ???? Thank you for sharing your tip Emily! I attempted to make the re bean paste today. It is cooling but I think there is too much liquid. Before adding the sugar, what should have been the level of water in the pot? I wanted to asking if adzuki beans were the same as azuki beans? They look the same but this is my first time making this so I wanted to make sure! I’ve tried this recipe before, but I normally use canned azuki beans and they come in 15oz cans, so I double up on the sugar, too. Is that wrong? Also, it always seems to harden because of the sugar… So what am I doing wrong? 4 1/2 hours (plus overnight soak) later finally have my chunky red bean paste. Was about to chuck my beans at the 3 hour simmer mark but I remembered reading in Mr. Ajikko (an old cooking manga) that a bit of baking soda softens beans. Gave it a shot. 1 hour later tender beans and half an hour later, got my paste chilling on the counter. So if your beans are still hard after 2 hours of cooking, try adding 1/8 teaspoon baking soda for roughly every cup of bean. It’ll taste soapy and harsh (cause baking soda is an alkaline) if you add way too much. 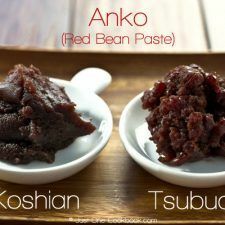 Can I cook azuki red beans in a pressure cooker to make anko? Hi Edison! Yes! I’m going to make a video… hopefully soon… 🙂 Hope you give it a try! Since I do not own a pressure cooker, do you think I could use a slow cooker to make this instead of stove top version? When I was younger, I’ve seen my mother & church members make this in a ‘kama’ so I know how long it takes to make it on the stove. hi! after soaking for about 20 hs and boiling for the first 5 minutes my beans were already quite soft, and then when i started the slower cooking proccess it took me about 15 minutes to get them easily smushed. do you think it is because it was too much soaking time? could this have any consequenses in the final product? Thanks in advance!! Hi~! Just want to ask whether I can substitute adzuki red beans with red kidney beans ? Hi Nick! I’m so happy to hear you enjoyed this recipe! Thanks so much for your kind feedback! Who typed a complete lot to keep trim. Hi! I soaked my beans for full 24 hours straight and even though I have been cooking them for about 4 hours already they are not turning soft at all. To be specific, I can crush them with my fingers, but the outer skin is quite hard, the interior feels more like crumbles instead of starchy and the taste is nutty,reminds me of that of peanuts. My bet about the reason for the long cooking time is that the beans must be old. Should I cook them more or start pouring the sugar as is? Hi Mawichan! Azuki skin is very hard compared to other beans. So when you can crush with your fingers, you might still feel the skin is harder (than inside beans). I’m not sure how hard it was, but you could crush it – usually you can’t if it is chunky and not soft if it’s not cooked long enough. I’m sorry for my late response, but did you add sugar to the beans? How did they turn? I let them cook for one more hour then added the sugar but not even the inside got soft. I even tried applying a little bit of baking soda. I’m so sorry to hear you had to throw away. I hate when that happens (especially after so much prep involved!). I usually my beans at a Japanese market and there are enough demands that I never had bad ones so far and didn’t know azuki beans can become bad like that. It’s good to know. Hope next time will be better. 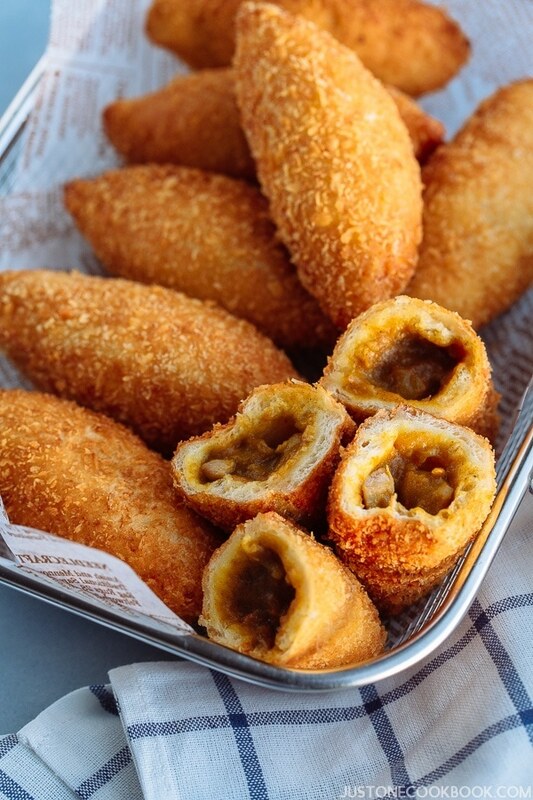 Your filling idea sounds very good and delicious! ???? Thank you for your complement on my instructions. I have done all the steps but the red bean turn out watery and the beans still in shape. The result is far from what tsubuan should be but the taste is quite similar. What should i do about it? Hi Sanny! First of all, Azuki has pretty hard shell, so unless you pinch between your fingers to check hardness, you may not know if the azuki beans are cooked through. You mentioned “watery”. Did you put too much water when you are boiling? The water level should be “just” above the beans, so it shouldn’t be watery. What do you use this for? If it’s for Zsenzai (red bean soup) etc, you don’t need to worry about the amount of water, but if you are going to make paste, beans shouldn’t have too much water. 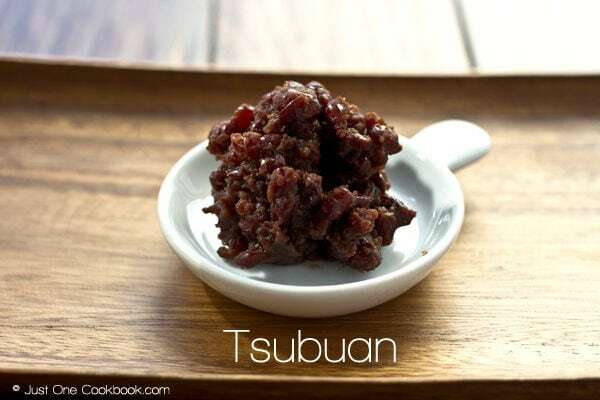 I just made a batch of tsubuan specially for my husband who loves red bean! It was really nice! 🙂 I like it very much too. Hi Zuyi! Thank you so much for trying this recipe! I think, if you stopped cooking a few minutes earlier, it won’t be as dry. I mentioned at Step 9, but even though you stopped cooking, moisture will continue to evaporate and the final result will be thicker than when you stopped cooking. Hope this helps! What type of beans can I use instead of Azuki beans? It’s perfect! I just tried it today. Hi Nami! Thank you for all your great recipes! I made this anko a couple of months ago and used it your Dorayaki recipe. It was a big succes! And now I want to make it again. But I was wondering if I can put it in the freezer. It’s a lot of work and then I can make it all in once and use it in parts. And do I have to do something with it to defrost it or just take it out and wait? Keep up the good work! Hi Femke! Yay! 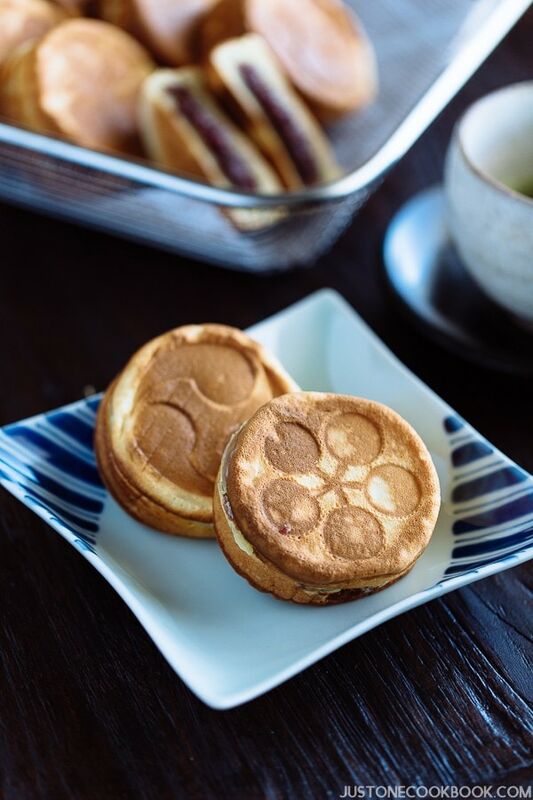 So happy to hear you liked the anko and dorayaki recipes! Yes, you can freeze them, but recommend individually pack for whatever amount you’ll need, so you don’t have to deal with extra or not enough. I usually heat up with a tiny bit of water and let cool again before I use, but you can use it by just defrosting it. Thanks so much for your kind words and encouragement! What beans can I sub for adzuki? I watched a movie called Sweet Bean about a Dorayaki Stand and in the movie this older woman teaches the man who operates the stand how to make a chunky red bean paste instead of the crappy bean paste he’s been buying in bulk from a supplier. At one point I assumed it was when sugar was being added It seemed like the guy reached into a container and scooped with his hands what seemed to be a clear sticky type of sugar about the size of a softball or a grapefruit worth. What type of sugar was that? Hi Edward! I watched it this summer so I know what you’re talking about. That is called Mizu Ame. You can buy a small jar of mizu ame in a Japanese grocery store (probably not in Asian grocery stores). We usually buy it and don’t make it on our own… I didn’t use it because 90% of my readers probably can’t get it, and many people in Japan use regular sugar. I have a kiddo who doesn’t like to eat and needs to gain weight in addition to three other children who are of a healthy weight. I want easy-to-grab snacks for him that are not altogether unhealthy. I was very happy to learn about Taiyaki and found your anko recipe. I wanted to make a lot of this, so I put the entire 28oz bag of Bob’s Red Mill Adzuki Beans in a large crock pot (after rinsing) and let them cook most of the day until they were easily mashable. This allowed the beans to cook without my constant attention. I then transferred the cooked beans to a pot, added 2 cups of home-raised honey (we’re beekeepers), and water to cover, then cooked it all down as per your instructions. We ran the sweet beans through the food processor when finished. This turned out very sweet and tasty. I have never had traditional anko, so I do not know for sure how it compares, but my results were well received by my family. I made up some boxed waffle mix and filled two Cake Pop pans. I used a melon baller to add anko to each pop of batter, then covered the exposed anko with a little more waffle batter. I cooked both trays in the oven at 350 for 30 minutes. We have anko left over to make more of these since I made so much. I expect my results are similar to Imagawayaki. My kids absolutely love these treats and we call them waffle poppers. Thank you so much for all of your information on Taiyaki and anko! This has really helped me make a high-protein treat that appeals to the children’s desire for sweets. I hope this helps my little one gain some needed weight. Hi Cassie! Wow, thank you so much for your sweet and kind feedback. First of all, I’m really happy to hear your children enjoyed anko treats! You did such a wonderful job making “waffle poppers” and they sound wonderful! Thanks for sharing your detailed tip with me and JOC readers! I just tried out this recipe yesterday afternoon, and it was really a great lesson on how to make bean paste! As you warned, it does take 1+ hours (it took me about 90 minutes for my beans to be cooked through). However, I ended up with a purplish paste that tasted delicious! The only change I made was reducing the amount of sugar; I just added sugar in until it was the right amount of sweetness for my family and me (surprisingly, about 75 to 100 grams? We really like a light sweetness, I guess!). Thank you so much for the recipe! I’ll be making anpan this coming weekend with my sister, and I’m sure we’ll enjoy it! Thank you so much for this recipe! Can this method also be used to make shiroan? Hi, when is the sugar added for the red bean paste? Hi Daffy! I did make it and here’s the link. Just FYI, this is a short cut version, not proper traditional way… skipping some steps. 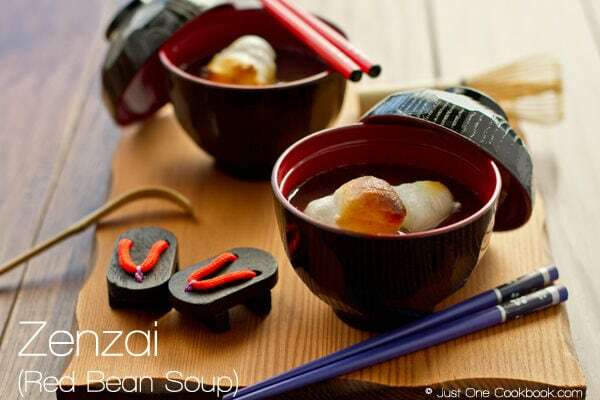 Is there any substitute for the azuki beans? I can’t order online because they are for a school project due in 3 days. Hi Angelica! I am so sorry for my late response. What did you need red bean paste for? If you are making sweets with red bean paste (like Dorayaki or Taiyaki), you can fill with Nutella or custard. But if red bean paste is the main topic… it’s hard… other “red beans” are not the same. Skins are thinner compared to hard shell azuki beans. I don’t think it has the same color at the end. Sorry I wish I knew best substitute for your school project. why not leave it in the pot? 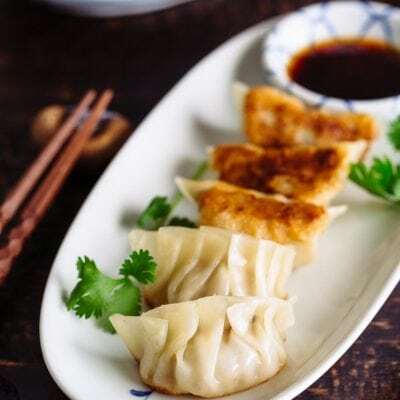 How do you make (flakey) Yaki Manju? Hi Aimee! I’ll add to the list. 🙂 Thank you for your request! Hi.. just found your site today while looking for red bean paste bun recipe. Can you tell when to add the sugar into? In your instruction, only mention to add salt. Thanks. Hi Sakinah! Red bean paste is not red like red ink color – it’s more like dark purple color (I don’t know English name for it, as we call it Azuki color in Japan! Haha). I love red bean bun but the sugar level is very high. Im trying to cut down my sugar intake. 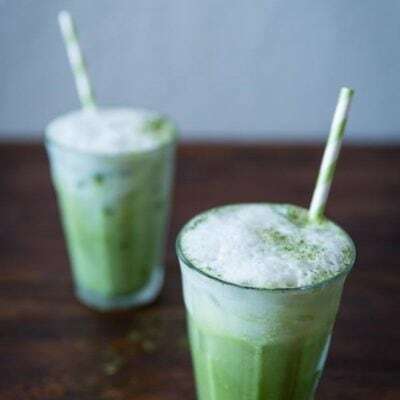 Is it possible to replace sugar with stevia. If yes, whats the measurement for it? AAAAAAAA! IT WORKED! followed this recipe to the letter and it turned out perfect! Thank you!! 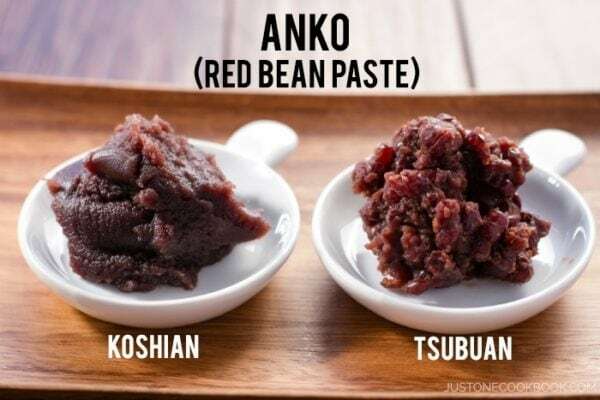 I’m curious if you’ve ever tried or seen anko canned (I mean home made anko then preserved in jam jars and heat sealed). Hi Sara! No, I usually freeze anko…. never can it before. It’s commonly frozen in Japan, and I didn’t think about canning before. I quickly checked in Japanese, and I haven’t found a method. Almost all sites recommend freezing for a longer preservation. 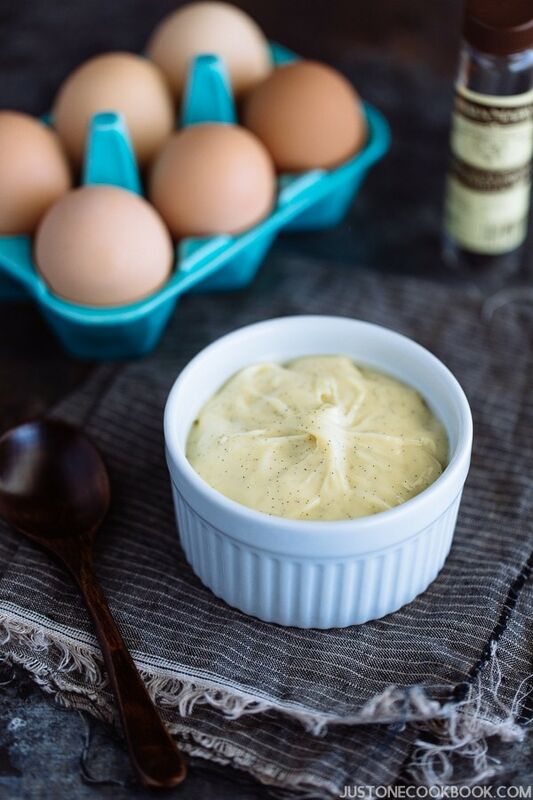 Thank you for posting this recipe; it is one of my go to sweet desserts. I do have a question, I’d like to remove the skins from the beans and I was curious when do you do that? After the filling is made or before making the filling? (I don’t have a pressure cooker and have to do it the old fashioned way through a sieve). Thank you. 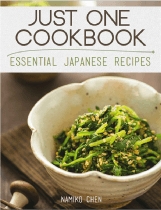 こんにちは、エリン！ Thanks so much for trying my recipes! I’m sorry this recipe didn’t turn out well. Water will continue to evaporate so you need to keep adding water to cover just above the beans. This is why making anko on the stovetop is tedious work. You can’t add more water than just above the beans, but you also can’t let it evaporated. So when you mash the beans to check if it’s done, the water should be STILL just above the beans. Then you add sugar in 3 separate times and let the beans absorb sugar until almost no water (see the bottom of the pan when you draw a line with a spatula). Remaining heat will continue to cook and evaporate water, so you don’t have to reduce so much. 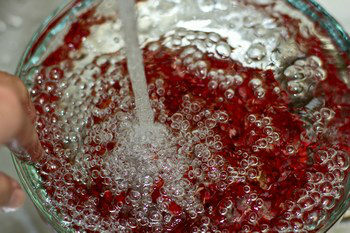 No need to evaporate water before adding sugar or no need to drain water before adding sugar. How come you still ended up with “very dry” beans with liquid? Did you use the right Azuki beans? Let me know your thoughts. I’ll be happy to help! 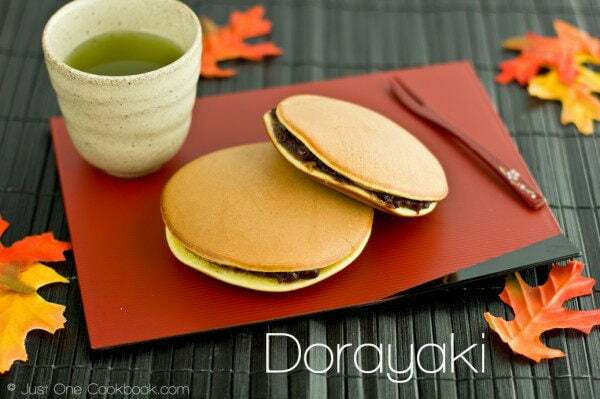 Which type of paste is better for dorayaki? Chunky or smooth? Very clear recipes and easy to understand.